Posted on June 27, 2012 by Dayna B.
I am really fortunate in that I earn a good amount of vacation leave with my employer (the federal government!). But there is not a lot of flexibility in when I might use that leave. Don’t get me wrong, I have plenty of opportunities, but I do have to adhere to specific timeframes that are generally the same from year to year, similar to a teacher’s schedule. A lot of people ask me how I can afford to go on so many vacations. It’s easy if you know where to find the good deals! There are a ton of really sweet travel deals available to everyone if you just know where to look. Most of these travel deals offer big discounts on packages designed for specific travel dates. When I find a great deal that coincides with my availability for vacation leave, I typically jump on it. And that’s how it’s done folks. Two of my favorite travel deal websites are Travelzoo and Shermanstravel. These sites compile a weekly list of their top travel deals. Subscribe to the site and get the weekly deals emailed to you automatically. Check out the weekly emails and if anything strikes your fancy, get ready to back your bags. On a regular basis I find amazing deals, but they often don’t coincide with my work schedule. But with a little patience, the right deal always comes around. Posted on June 25, 2012 by Dayna B.
I am not always in agreement with “the more, the merrier” philosophy, but in this particular instance I am! Rob’s Uncle Tom will now be joining us on our vacation. Tom was hoping to be a part of our initial booking, but there were some scheduling conflicts that made it impossible. Those conflicts have since disappeared so he is back in again. We were also fortunate enough to get him a seat on our non-stop flight at a reasonable price considering the relatively last minute booking. Rob and I have traveled with Aunt Winnie and Uncle Tom on previous vacations, but never the both of them together. They are both a ton of fun and we are looking forward to double the fun on this trip! Posted on June 23, 2012 by Dayna B.
I am really excited about my upcoming trip to Ireland with Rob and his Aunt Winnie and Uncle Tom. We will be staying at Adare Manor for six nights and then one night in Dublin. I have been to Dublin once before, but during this trip I will have the opportunity to see much more of the country. Rob and Winnie (and Tom?) have never been to Ireland before, so this should be an exciting adventure for us all. I look forward to sharing the experience with all of you. Posted on June 21, 2012 by Dayna B. A blog to document my travels makes perfect sense! I don’t know why I didn’t think of this sooner. What better way to share my experiences with friends and family, as well as catalogue my experiences for my own nostalgic purposes. Better late than never, I suppose. But now I have to decide if I should retroactively post my travels from the previous decade…or only move forward from this point on. My passion for travel began over a decade ago while I was in the military and stationed in Germany. It was incredible to be able to hop in the car and be in another country in just a few hours. I lived in Germany for 3 years and during that time I made use of any opportunity I had to travel. I wasn’t able to make it to all of the countries in Europe, but I definitely knocked out a good chunk. It is a personal goal to see as much of this world as I possibly can in the short amount of time that I am here. 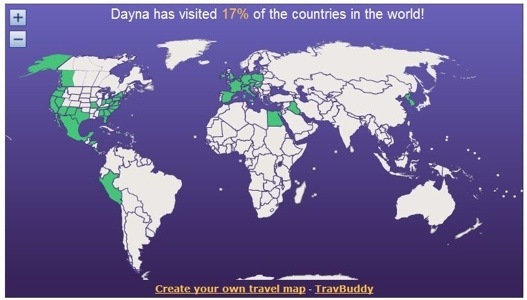 To say I was bit by the travel bug is an understatement. For me, the travel bug is like a good parasite and we have a symbiotic relationship in which travel benefits us both. Making time and saving money for new travel destinations is a top priority for me. I would rather wear inexpensive clothes and drive a modest car in order to allow myself a visit to at least one new country every year. I feel like I have already been to so many countries, but there is still way too much white on the map below for my liking. While no destinations are ever off-limits for me, sometimes I can be quite the travel snob! I am not referring to luxury vs. roughing it here. I’m more of an international travel snob. Typically, I will turn my nose up at opportunities for domestic travel, always preferring a new stamp on my passport instead. I realize the United States have many wonderful things to see, but I can save them for when I am older. Don’t judge me.